We all like to live as efficiently as possible. Otherwise, how else do you explain the obsession with accuracy as well as punctuality? Not only that, it is all about making sure that as many things as possible get done within the shortest time available. The modern day road warrior has his or her fair share of gadgets, where a smartphone is more or less a given, while other folks tend to complement their handsets with the presence of a tablet as well. Throw in a dedicated GPS unit and another portable USB-powered device, and you’ve got a fair amount of gizmos to juice up at the end of the day. With the $99.95 Four Device Charging Clock Radio, you need not fret on your travels. As its name suggests, the Four Device Charging Clock Radio will be able to charge up to a quartet of devices simultaneously, thanks to the four USB ports that are available. 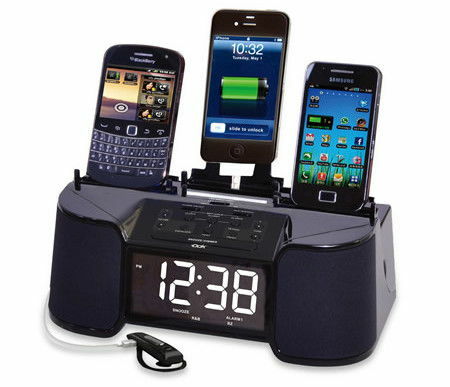 There will be a trio of docks that are located on top of the clock radio which will ensure that your devices remain upright, while the radio will play music from any one connected device. The dock itself will also be able to play your favorite tunes as long as it is connected to a compatible device, where the dual integrated stereo speakers deliver music to your ears. The entire Four Device Charging Clock Radio takes up less space than a toaster, and comes with built-in power surge protection, an FM radio, an LCD clock, and dual alarms.